To the deer hunter, the arrival of autumn means hunting season has arrived. (In fact, in some zones the bow season actually opens before the autumnal equinox!) New Jersey's largest game species with an open season is the white-tailed deer, and it is targeted by more hunters than any other species. Knowing the deer's natural ways can increase the enjoyment of the sport and the chances of success. During the anterless permit seasons hunters may harvest fawns as well as mature bucks and does. (See the DIGEST for specific regulations on each season and zone.) Fawns weigh approximately 7½ pounds at birth while adults average 100 pounds (females) to 150 pounds (males). Actual weights vary depending on habitat-type and quality, age of the animal and season of the year. The maximum life expectancy of a deer could exceed twenty years. (A fawn ear-tagged in the southern New Jersey Pinelands was recovered 18½ years later during the 1986 permit muzzleloader season. This may be the oldest tagged or verifiable aged specimen from the wild). However, the average age of male deer in New Jersey is less than two years, due to the pressures of hunting. During the six-day firearm season, only deer with at least one antler 3 inches or longer are legal. Antlers are composed of true bone that grows from the front of the skull each year beginning in April. The bone is full of blood vessels and nerves and is covered with "velvet". Growth continues through August or September, when calcium is deposited along the blood vessels. The bone then hardens, and the velvet dries up and sloughs off or is rubbed off against trees and shrubs. By November, all of the velvet is rubbed off. Deer shed their antlers by winter's end. Antlers play an important role in deer society. Rubbing the antlers on trees marks territories, and sparring matches determine dominance. Rubbing creates tell-tale "rubs" and sparring leaves the ground disturbed. Locating these tell-tale signs is one way to target an area with active bucks. Knowing where deer are active and their movement patterns can be critical to selecting where to hunt. Although the deer is a large animal, its home range is one of the smallest among wild ruminants. Studies in Hunterdon County (January 1970 to July 1976) indicated the main home range size to be one square mile or less. A study in the Pine Barrens (March 1973 and July 1978) indicated that home range size varied between 120 and 400 acres; however most activity was within "core" areas of 40 to 60 acres. The general home range size is the same for males and females; however, there is a greater tendency for bucks to disperse long distances. Does appear to be more reluctant to leave the regular feeding areas and remain close to home during the fawning season. Their movements during the "rutting" (breeding) season tend to be in large circles within their range rather than dispersal out of the range. The principal month for dispersal is November, which coincides with the peak of the rut. November coincides with the permit bow season in most zones. With a singular purpose to their activity, bucks are on the move and generally less wary. This can be an advantage to hunters but a liability to motorists. Does are also moving and will come into heat for a 24-hour period (if not bred, she will come into heat approximately 28 days later). The shorter days of autumn and the animal's condition govern the exact timing of the rut. Studies indicate that the peak of the mating season in New Jersey occurs during the first three weeks of November in northern counties and during the last three weeks in southern counties. Males are usually incapable of breeding until their second year. Thanks to sound management, New Jersey's deer herd is thriving. However, in our densely populated and increasingly developed state, management objectives call for reducing the herd on about three-quarters of their range. This means the role of hunters is an essential part of deer management strategy. Knowing the behavior of deer will increase your chances of seeing and perhaps harvesting them. New Jersey's liberal seasons and bag limits allow hunters numerous days of outdoor recreation. 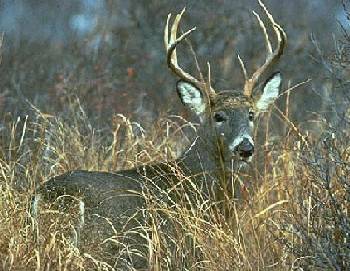 The Division of Fish and Wildlife encourages hunters to get out and enjoy this time of year, and to be our partner in keeping white-tailed deer an asset among our wildlife resources. Click for more information about deer in New Jersey.